Indian Wedding is one of the most cherished moments for the bride & Groom and the guests attending the wedding. As a wedding decorator, you must hear of many ideas that include decorating the wedding area by fresh flowers, ribbons, lights, etc. but how about an idea of adding balloons to increase your wedding glamor in a cost-effective way. Well, the idea sounds great. Why should you try it?We are here with some of the useful and different ways to add balloons in an Indian wedding decoration. Here we go..
1. Use Balloons To Decorate The Entrance Of Your Wedding Hall. This idea works for most of the glamorous weddings hall. If you are a wedding planner, you can ask your balloon decorator to create an arc at the entrance. You may create multiple single arcs of colorful balloons and then join them together to form the arc that can easily fit the entrance area. Don’t forget to keep the color of interior designs in view and make sure you select the balloon colors according to the theme of the day. 2. Use Balloons To Create An Arc At The Backdrop Of The Stage Where Bride And Groom. Yes, you can ask your balloon decorators to create arc just similar to the process that we used in the first trick. This arc can be placed at the backdrop of the sitting space where the couple would sit and exchange garlands. This background will make the stage appealing and also help the photographer in clicking beautiful pictures of the couples and the guests as well. 3. Hang Balloons Over The Center Table Of Each Of Your Guest. You can inflate bigger-sized balloons and tie them to the center table of your guests.To make the decoration specific to the guests, you can write the name of the respective guests who would be sitting in the wedding area. This is one of the best ideas of wedding decoration where your guests will feel special when they will see their names hanging over the table. Make sure you choose the balloon colors wisely so that it can easily match with the other decorative things used in the party area. 4. Using Balloons To Decorate The Ceiling Of The Wedding Area. The first and the second ideas worked wonders where you want to give preference to individual guests. But if you are organizing a grand wedding party where you have thousands of guests. It becomes quite difficult to arrange arc and even the centerpiece made of the balloon. Under such circumstances, all of the above ways cannot be implemented. Here, you can decorate the ceiling of the wedding area so that your party guests can have a glimpse of it. Above are the simple yet effective ideas to add balloons in an Indian wedding decoration. 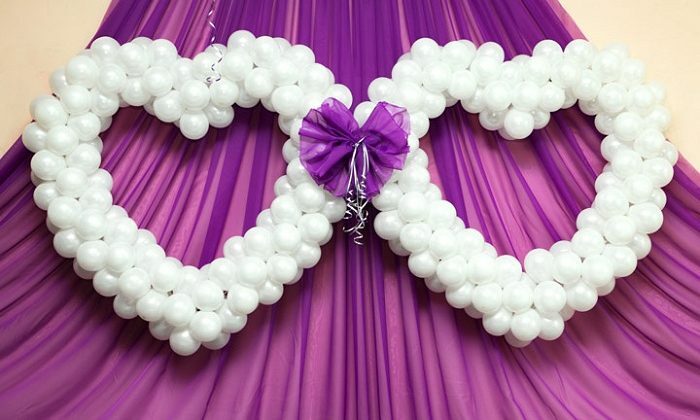 Hopefully, you find these ideas useful and consider this decoration material “Balloons, the most budgetary one. Try these ways out and surprise your guests in a unique way.